Since a default Windows environment provides no tools for displaying the access rights of users or groups it can be quite hard to manage the network permissions. Permission Analyzer solves this problem by providing a powerful graphical tool for system admins. The software offers a wizard-like approach to determine whether the system access permissions are properly set need to be changed or have been altered by people who are not authorized to make changes. 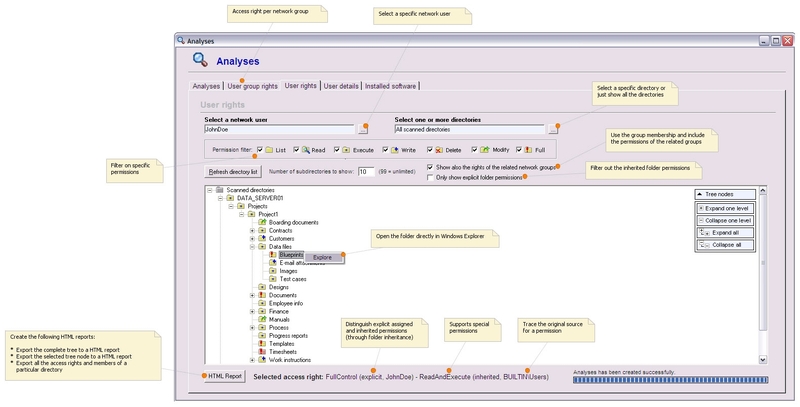 Permission Analyzer can generate a clear overview of the access rights of each user or user group. Scans can be initiated manually or scheduled to run regularly. Its easy to specify the directories to be scanned and to limit the number of subdirectories that will be scanned. Export to HTML reports is supported. Permission Analyzer provides a more visual approach with pop-up windows interactive lists with buttons you can click to view permission by individual or group and easy-to-find search boxes. Its easy to set a permission filter and only look for list read execute modify write or full permissions. Access rights of the related groups and inherited groups of a particular user can be included in the overviews. Based on the programs analysis changes on the access rights to any folder can be made by opening the folder and making the changes with Windows.Next to permission overviews Permission Analyzer can generate an overview of all the software applications installed on each workstation. It is easy to filter on workstation or software application. Better support for very large data sets define policies and get notified by e-mail in case unwanted permissions are found in your network better support for special permissions scan specific OUs in the AD to scan select multiple members modify permissions and schedule reports.